As Illinois’ fiscal health continues on an uncertain path, the state legislature and governor’s office continue to debate the possibility of a statewide casino expansion. One proposal that advanced in the legislature allowed for five additional casinos to be opened across the state, including one land-based casino in Chicago. It would also have expanded gambling at existing casinos and at racetracks. What are the potential community and statewide implications of for this type of expansion? Were the five proposed locations the most fiscally and economically viable? Or, are there alternative sites that should be considered for the future? 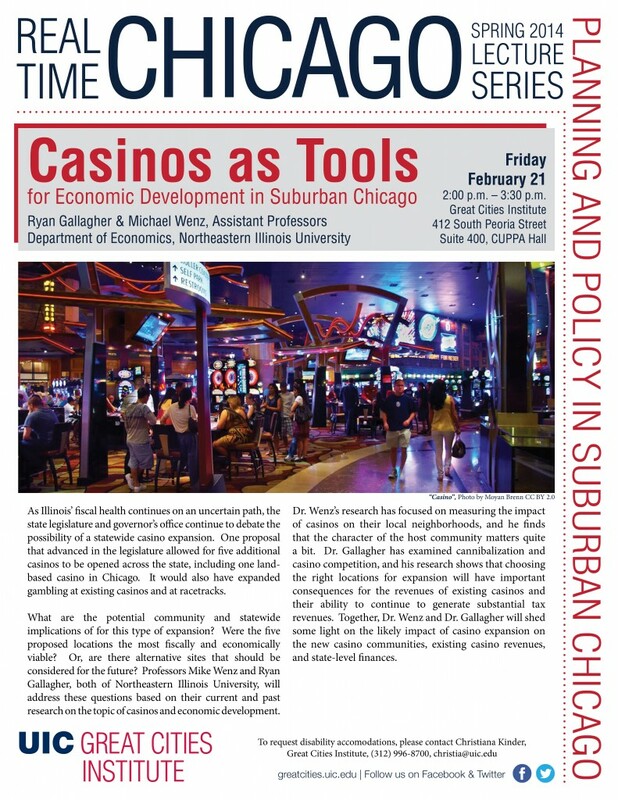 Professors Mike Wenz and Ryan Gallagher, both of Northeastern Illinois University, will address these questions based on their current and past research on the topic of casinos and economic development. Dr. Wenz’s research has focused on measuring the impact of casinos on their local neighborhoods, and he finds that the character of the host community matters quite a bit. Dr. Gallagher has examined cannibalization and casino competition, and his research shows that choosing the right locations for expansion will have important consequences for the revenues of existing casinos and their ability to continue to generate substantial tax revenues. Together, Dr. Wenz and Dr. Gallagher will shed some light on the likely impact of casino expansion on the new casino communities, existing casino revenues, and state-level finances.